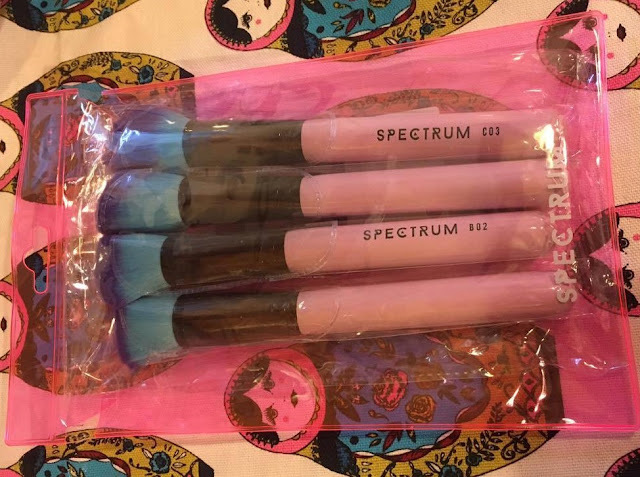 I am so excited to review some of the Spectrum Collections brushes today! 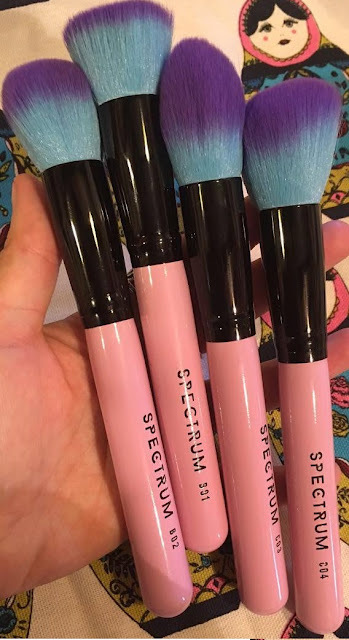 I think we've all seen their pretty mermaid-esque makeup brushes on our Instagram feed - they're absolutely gorgeous. As a company, their style reminds me a lot of Too Faced. I've swooned after them for a while and now finally own some of my very own. I ordered the four piece contour kit (£29.99) and when a matte black padded mail bag dropped on my doormat, I instantly knew it was my brushes! The aesthetic of this company is just so pretty, when I opened the bag my brushes were packaged in a transparent pink case which closes with a popper. Perfect for popping bits in when travelling. Before discussing each individual brush, I would just like to note that these brushes are beautifully soft and the handles feel substantial without being heavy. I have used these brushes to create my base and they work amazingly. So they really are more than just a pretty face! Additionally, they are completely vegan and cruelty free.. Yay! The first brush is a flat top brush which I normally refer to as a stippling brush. It's perfect for blending liquid foundation or for applying cream contour or blush. I love this shape brush and use it all the time so I'm so glad that this was included in the set. I used this to apply my usual foundation and as well as being a joy to use, I got a lovely finish from it. I use this as a general powder brush. It can be used to apply pressed powder, bronzer or blusher and it does this beautifully. This brush is the star of the show for me. I've never actually had a brush this shape, it's fluffy and dense and tapers at the end which makes it perfect for applying highlight and contouring around the hairline. It's extremely effective as it allows a high degree of precision which results in a more professional looking face. I love love love this brush and don't know how I ever did my makeup without it! This brush is perfect for contouring. I enjoy using angled brushes and this one is a dream to use. I would definitely go for one of the sets if you're going to buy from Spectrum Collections. By purchasing a set you save just under £6 which is almost the price of a whole brush so the sets are amazing value. If you're in the market for some beautiful, soft and dense makeup brushes then I urge you to check out Spectrum. Their website can be accessed here, and here is their Instagram.